But while big ideas are important, building bridges is hard work. Many of the most visionary ideas are stopped in their tracks by financing, planning, or engineering reasons. We decided to look at four great bridges that never saw the light of day, and show them as they might have appeared. The Channel Tunnel sounded pretty sci-fi before it was built, but the experience of taking a train beneath the sea from France to England is actually pretty mundane. It would have been nice to have a window or two to see the aquatic world outside. But Jean-Paul Viguier’s EuroRoute Bridge, which competed for the honour of connecting Calais and Dover, might have been a bit too sci-fi for comfort! 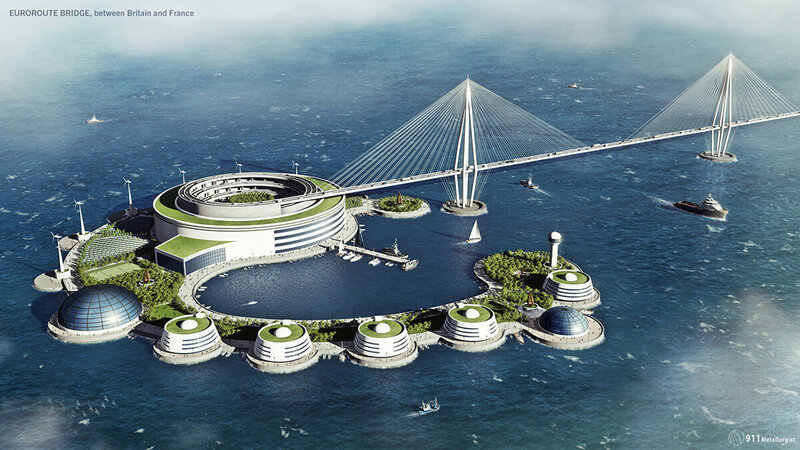 In a design that would have worked for as a metaphor for Anglo-French relations, Viguier’s bridge would have reached just part of the way across the Strait of Dover before plunging into the sea. More precisely, the bridge from Calais would lead to a mid-sea island, from where it would spiral down past shops, hotels, and leisure facilities into an undersea tunnel. From there, the road would rise up to an identical island off the coast of England, leading back up onto a continuation of the bridge and into a hole bored into the white cliffs of Dover. Whew! 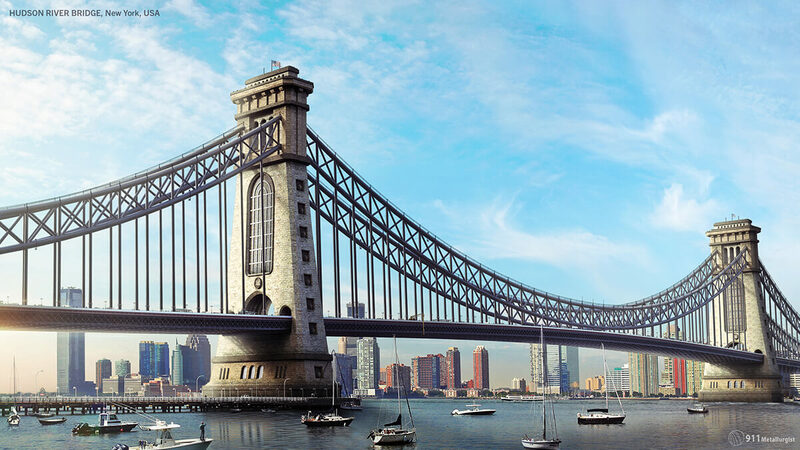 Gustav Lindenthal’s bridge was to have been twice the length of the George Washington Bridge, connecting New York City’s 57th Street to Hoboken in New Jersey. It was an epic vision, with room for 12 rail tracks, 24 motor lanes, and two pedestrian walkways. The 8-foot concrete cornerstone was laid on June 18th, 1895, but that’s about as far as the bridge ever got. Raising the $37 million required to complete the project became unfeasible in the wake of the 1893 financial crisis. The cornerstone remains, however, as a curio for visitors to The Stevens Institute of Technology in Hoboken, where it can still be found today. 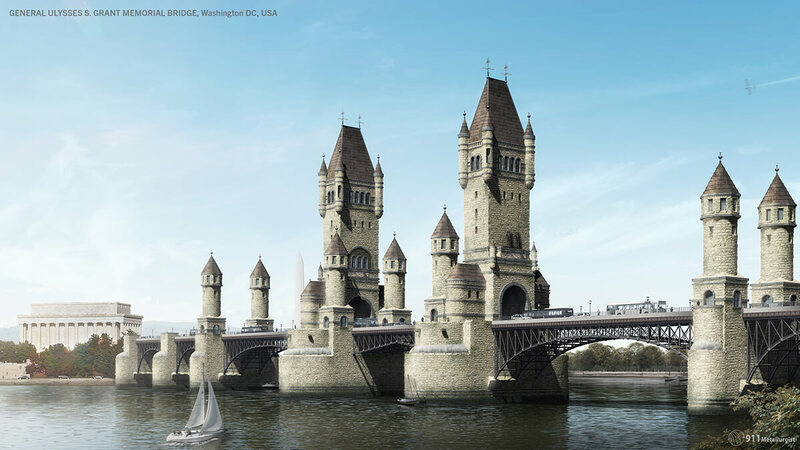 John L. Smithmeyer and Paul J. Pelz drew up plans for a bridge to honour the 18th President of the United States just where DC’s Arlington Memorial Bridge crosses today. But the government was unnerved by the bridge’s association with the Union Army general and vetoed the project’s funding. In its earliest incarnation, the Russians envisioned a bridge over the Kerch Strait as the beginning of a new path from Europe to Asia. The British government, too, eyed the route for its potential for easy passage to colonized India. Then two world wars hit, and plans by Hitler’s architect, Albert Speer, to build a crossing, eventually dissolved along with the Russo-German alliance. 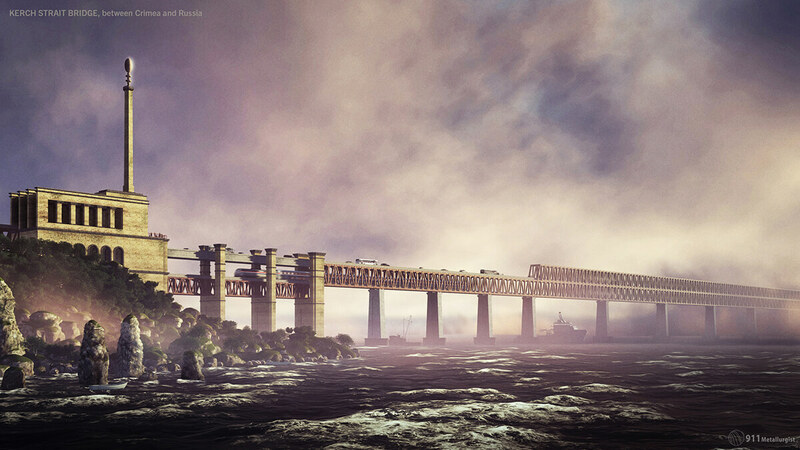 After WW2, the great Russian engineer Boris Konstantinov proposed a stark and melancholy bridge across the same gloomy corner of the Black Sea. Work began but despite the inclusion of hefty monuments in honour of Joseph Stalin, the Soviet leader pulled the plug for economic reasons. With today’s visionaries look towards a greener future of sustainable living bridges and garden walkways, we’re saying goodbye to an era of monolithic engineering feats of the post-industrial age. Who knows what solarpunk visions are forming on the desktops of today’s great architects?